The Navy Cross is the United States military’s second-highest decoration awarded for valor in combat. 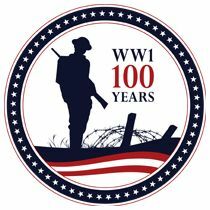 For actions in WWI, 19 U.S. Marines from Texas (place of birth and/or listed hometown) received the Navy Cross for their heroic actions. Percy Duryea Cornell was twice awarded the medal for separate actions. Three were awarded posthumously. Approximately 10% of U.S. Marine Corps citations contain not place of birth or hometown. John W. Thomason was one example shown on our list who was not listed with a place of birth or home town (we included him since his known home town was Huntsville, Texas). See our Google Drives shared drive resource and our list of all Texas senior valor awards (Medal of Honor, Distinguished Service Cross, and Navy Cross). The Navy Cross was established by Act of Congress (Public Law 65-253) and approved on February 4, 1919 retroactive to 6 April 1917 and is awarded primarily to a members of the United States Navy, U.S. Marine Corps, and the U.S. Coast Guard (when operating under the Department of the Navy) for extraordinary heroism. 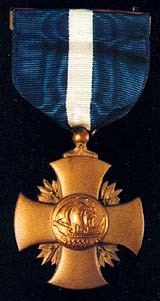 Originally, the Navy Cross was lower in precedence than the Medal of Honor and the Navy Distinguished Service Medal, because it was awarded for both combat heroism and for “other distinguished service”, retroactive to 6 April 1917. In some cases during WWI, Marines and Sailors were awarded the Army Distinguished Service Cross and the Navy Cross for the same action (most DSC’s were later converted to Navy Cross awards). The U.S. Navy awarded 1,298 Navy Crosses during WWI. Navy citations very rarely note the home town of the recipient. Consequently, no Texas sailors are shown here. Additionally, the Navy awarded the medal for a wide spectrum of circumstances, from administrative duties critical to the war, rescue operations, mine clearing, the influenza epidemic, and clearly heroic actions in direct combat situations. 78th Company, 6th Regiment (Marines), 2d Division, A.E.F. The Navy Cross is presented to Lambert Bos, Private, U.S. Marine Corps, for extraordinary heroism while serving with the 78th Company, 6th Regiment (Marines), 2d Division, A.E.F. in action near Blanc Mont Ridge, France, October 3, 1918. Private Bos, with two other volunteers, flanked a machine-gun nest and, after one of his comrades had been wounded, captured fourteen men and two machine guns. Later, he aided in the capture of forty other prisoners in a dugout. 81st Company, 6th Machine-Gun Battalion, 6th Regiment (Marines), 2d Division, A.E.F. The Navy Cross is presented to James R. Brummett, Private, U.S. Marine Corps, for extraordinary heroism while serving with the 81st Company, 6th Machine-Gun Battalion, 6th Regiment (Marines), 2d Division, A.E.F. in action near Thiaucourt, France, September 12 – 16, 1918. By effective use of an automatic rifle, Private Brummett defended the left flank of his platoon, thereby preventing the enemy from reaching the rear of his lines. On several other occasions, he volunteered and carried messages through terrific bombardment. 55th Company, 5th Regiment (Marines), 2d Division, A.E.F. The Navy Cross is presented to David L. Buford, Gunnery Sergeant, U.S. Marine Corps, for extraordinary heroism while serving with the 55th Company, 5th Regiment (Marines), 2d Division, A.E.F. in action in the Bois-de-Belleau, France, June 13, 1918. After being wounded Sergeant Buford, with exceptional courage, continued to lead his section forward against a machine-gun nest, and captured it. 75th Company, 6th Regiment (Marines), 2d Division, A.E.F. The Navy Cross is presented to Grover M. Chatman, Private, U.S. Marine Corps, for extraordinary heroism while serving with the 75th Company, 6th Regiment (Marines), 2d Division, A.E.F. in action near Thiaucourt, France, September 15, 1918. While his platoon was occupying an outpost line in close proximity to the enemy, Private Chatman voluntarily crossed an open space swept by machine-gun fire and overcame three snipers who had been harassing his platoon. The Navy Cross is presented to Percy Duryea Cornell, Captain, U.S. Marine Corps, for extraordinary heroism while serving with the 5th Regiment (Marines), 2d Division, A.E.F. in action near St. Etienne, France, October 4, 1918. Captain Cornell courageously led his company through heavy artillery and machine-gun fire in the attack on a strongly defended enemy position. His company held the exposed flank and later, when the battalion withdrew, he skillfully covered the other shifting units while exposed to heavy enemy fire. The Navy Cross is presented to Percy Duryea Cornell, Captain, U.S. Marine Corps, for extraordinary heroism while serving with the 5th Regiment (Marines), 2d Division, A.E.F. in action on July 18, 1918, near Soissons, France. 96th Company, 6th Regiment (Marines), 2d Division, A.E.F. The Navy Cross is presented to Herbert D. Dunlavy, Private, U.S. Marine Corps, for extraordinary heroism while serving with the 96th Company, 6th Regiment (Marines), 2d Division, A.E.F. in action at Bouresches, France, June 6, 1918. Private Dunlavy showed conspicuous courage in capturing a machine gun unassisted during the street fighting. He was killed in the repulse of the enemy on the night of June 7 – 8, 1918. Headquarters Company, 5th Regiment (Marines), 2d Division, A.E.F. The Navy Cross is presented to William M. Feigle, Sergeant, U.S. Marine Corps, for extraordinary heroism while serving with the Headquarters Company, 5th Regiment (Marines), 2d Division, A.E.F. in action near Beaumont, France, November 10, 1918. When an ammunition train was passing through a town, one of the trucks was struck by a shell and set on fire. The blazing truck was abandoned and, knowing that it soon would explode and kill all those in the vicinity, Sergeant Feigle jumped on the truck and drove it to the outskirts of the town, thereby saving the lives of at least thirty-five people. 79th Company, 6th Regiment (Marines), 2d Division, A.E.F. The Navy Cross is presented to Harry Benton Fletcher, Corporal, U.S. Marine Corps, for extraordinary heroism while serving with the 79th Company, 6th Regiment (Marines), 2d Division, A.E.F. in action in the capture of Bouresches, France, June 6, 1918. After being severely wounded, Corporal Fletcher refused to go to the rear for treatment, but remained at his post and urged on his men to renewed efforts. 6th Machine-Gun Battalion, 6th Regiment (Marines), 2d Division, A.E.F. The Navy Cross is presented to Jack S. Hart, First Lieutenant, U.S. Marine Corps, for extraordinary heroism while serving with the 6th Machine-Gun Battalion, 6th Regiment (Marines), 2d Division, A.E.F. in action near Thiaucourt, France, September 15, 1918. Acting as company commander, Lieutenant Hart advanced with the first wave of infantry to locate favorable positions for his guns. He discovered an enemy machine-gun which he alone attacked, and although severely wounded, succeeded in capturing the gun and taking the crew prisoners. The Navy Cross is presented to Gillis Augustus Johnson, Second Lieutenant, U.S. Marine Corps, for extraordinary heroism while serving with the 5th Regiment (Marines), 2d Division, A.E.F. in action near St. Etienne, France, October 4, 1918. Second Lieutenant Johnson volunteered and led an attack upon enemy machine-gun positions under intense machine-gun fire and artillery barrage, and although severely wounded in the leg, succeeded in cleaning out several machine-gun nests, capturing guns and a number of prisoners. 8th Company, 5th Regiment (Marines), 2d Division, A.E.F. The Navy Cross is presented to Jack Jordan, Corporal, U.S. Marine Corps, for extraordinary heroism while serving with the 8th Company, 5th Regiment (Marines), 2d Division, A.E.F. in action near St. Etienne, France, October 4, 1918. After all the other members of their crews had become casualties, Corporal Jordan and another soldier advanced with their gun through heavy artillery and machine-gun fire to an advanced position and put up their gun in action in support of Infantry. They remained in this position after the Infantry had retired and until their ammunition was exhausted. 43d Company, 5th Regiment (Marines), 2d Division, A.E.F. The Navy Cross is presented to Will H. Lee, Corporal, U.S. Marine Corps, for extraordinary heroism while serving with the 43d Company, 5th Regiment (Marines), 2d Division, A.E.F. in action near Blanc Mont, France, October 4, 1918. During an advance of his company, Corporal Lee volunteered to carry a wounded comrade to a place of safety through hostile machine-gun fire. He later brought a wounded soldier from “No Man’s Land” through a heavy machine-gun and artillery barrage. 82d Company, 6th Regiment (Marines), 2d Division, A.E.F. The Navy Cross is presented to Clinton S. Lindsey, Private, U.S. Marine Corps, for extraordinary heroism while serving with the 82d Company, 6th Regiment (Marines), 2d Division, A.E.F. in action in the Bois- de-Belleau, France, on June 6, 1918. Private Lindsey displayed commendable gallantry when he voluntarily sought permission to leave shelter and, at great exposure to himself, rescued a helpless wounded officer from an open field. He was killed in action June 8, 1918. 91st Company, 6th Regiment (Marines), 2d Division, A.E.F. The Navy Cross is presented to William B. Moore, Second Lieutenant, U.S. Marine Corps, for extraordinary heroism while serving with the 91st Company, 6th Regiment (Marines), 2d Division, A.E.F. in action at Bouresches, France, June 6, 1918. Second Lieutenant Moore volunteered and took a truck load of ammunition and material into Bouresches, France, over a road swept by artillery and machine-gun fire, thereby relieving a critical situation. 18th Company, 5th Regiment (Marines), 2d Division, A.E.F. The Navy Cross is presented to John Edward Ryan, Corporal, U.S. Marine Corps, for extraordinary heroism while serving with the 18th Company, 5th Regiment (Marines), 2d Division, A.E.F. in action near St. Etienne, France, October 4, 1918. Corporal Ryan requested and obtained permission to lead his company’s advance. In performing this task, and providing for the safety of his men, Corporal Ryan fell, wounded through the leg. 80th Company, 6th Regiment (Marines), 2d Division, A.E.F. The Navy Cross is presented to Donald Ramsay Sheaff, Corporal, U.S. Marine Corps, for extraordinary heroism while serving with the 80th Company, 6th Regiment (Marines), 2d Division, A.E.F. in action in the Bois-de-Belleau, France, on June 6, 1918. In delivering messages, Corporal Sheaff voluntarily chose the most direct route, although it was through a machine-gun barrage, to deliver information which prevented the bombardment of positions that had just been occupied. He took the path of danger to save his comrades. 95th Company, 6th Regiment (Marines), 2d Division, A.E.F. The Navy Cross is presented to Royal Hamilton Clater Shepherd, Private, U.S. Marine Corps, for extraordinary heroism while serving with the 95th Company, 6th Regiment (Marines), 2d Division, A.E.F. in action near Tigny, France, July 19, 1918. Private Shepherd entered the action with badly burned foot, which fact he concealed from his officers. Shot through the shoulder early in the advance and unable to hold his position in the firing line, he carried wounded men to shelter for six hours, all of the time under heavy fire of the enemy. He yielded to treatment himself only when he had become exhausted from the effects of his injury. 49th Company, 1st Battalion, 5th Regiment (Marines), 2d Division, A.E.F. The Navy Cross is presented to John W. Thomason, Jr., Major, U.S. Marine Corps, for extraordinary heroism while serving with the 49th Company, 1st Battalion, 5th Regiment (Marines), 2d Division, A.E.F. in the Battle of Soissons. When a German machine gun nest held up a Marine advance on July 18, 1918, Major (then Second Lieutenant) Thomason and one of his men fearlessly advanced on the position and killed thirteen of the enemy. 97th Company, 6th Regiment (Marines), 2d Division, A.E.F. The Navy Cross is presented to John M. Worrell, Private, U.S. Marine Corps, for extraordinary heroism while serving with the 97th Company, 6th Regiment (Marines), 2d Division, A.E.F. in action at Bouresches, France, on June 6, 1918. Private Worrell voluntarily obtained permission to leave shelter and fearlessly went into heavy fire in order to rescue wounded from a field, then under artillery and machine-gun bombardment, continuing his heroic work until he was himself wounded. Department of Defense. Army Distinguished Service Cross Recipients. https://valor.defense.gov/Recipients/Marine-Corps-Navy-Cross-Recipients/. Accessed 6/30/18. HomeOfHeroes.com. 2115 West 13th Street – Pueblo, CO 81003. http://www.homeofheroes.com/members/02_NX/ncross_list.html. Accessed 1/17/18. Wall of Valor Project. https://valor.militarytimes.com/conflict/2. Accessed 6/30/18.